Modern, Southbank, and Amazing Views. Luxury condo with panoramic river views! Welcome to downtown's most sought after address-THE PENINSULA. Quiet 3 Bed/3.5 Bath corner unit Sky Home has a private elevator foyer. Every room has exquisite floor to ceiling windows. 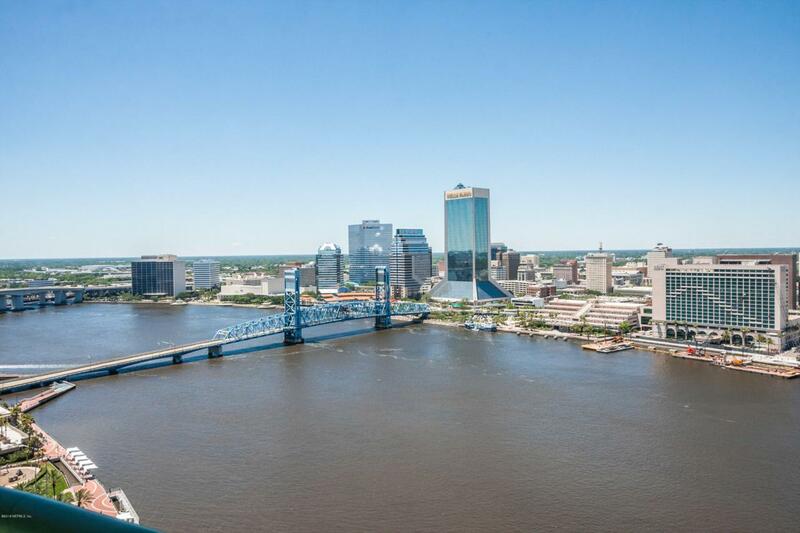 Wrap-around balcony allows total appreciation of Downtown Jacksonville, The St. Johns River, TIAA Bank Field, and bridges. Pristine Gourmet kitchen features upgraded stainless Kitchen-Aid appliances, Black Absolute granite, custom Italian Cherry cabinets, under-cabinet lighting, and upgraded tile. Three master suites offer luxurious Italian marble, seamless glass shower enclosures and over-sized garden tubs. This home is just waiting for one more thing... You! **24 hour notice PLEASE.Watch fireworks and boat parades from your own living room. Take the water taxi or the skyway across the river to enjoy downtown Jacksonville art walks and additional restaurants and recreation. Just a quick walk to San Marco Square for an evening with friends. This location is truly magnificent.